OTTAWA, ONTARIO--(Marketwire - Oct. 19, 2010) - Today, the Government of Canada took action to protect the health and safety of children by appealing to members of industry to voluntarily stop production, importation and sale of children's jewellery made with the intentional use of cadmium or cadmium-containing materials. "The health and safety of Canadian children continues to be a top priority for our Government" said the Honourable Leona Aglukkaq, Minister of Health. "I strongly urge industry to act in the interest of the well-being of children and to stop using this toxic heavy metal in children's jewellery." 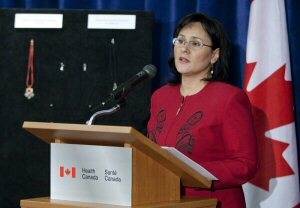 Testing by Health Canada has found cadmium may be increasingly substituted for lead in inexpensive jewellery. While there is no known risk to health from simply wearing jewellery made with high levels of cadmium, Health Canada's risk assessment has concluded that there is foreseeable potential for sucking, chewing or swallowing of such jewellery which may lead to serious health effects from cadmium exposure. Health Canada will continue to closely monitor compliance with this request for voluntary action. If no improvement is found, then mandatory requirements may be introduced via the federal regulatory process. In June 2010, the Government introduced Bill C-36, the proposed Canada Consumer Safety Act. If passed into law, the Act would modernize the government's approach to consumer product safety and include new measures, such as the ability for Health Canada to order mandatory product recalls of unreasonably hazardous consumer products and the mandatory reporting of incidents or deaths for all consumer products in Canada. For more information on the hazards associated with lead and cadmium in children's jewellery, please read this Health Canada Advisory ( http://www.hc-sc.gc.ca/ahc-asc/media/advisories-avis/_2010/2010_07-eng.php ).